Founded in 1975 by Dr. José Antonio Abreu in Venezuela, El Sistema has been described as a movement of music education for social change. Ideas of community and citizenship are central to El Sistema-inspired teaching. Students progress through peer to peer learning in ensembles and orchestras. [ Video: How to make a paper violin ]. 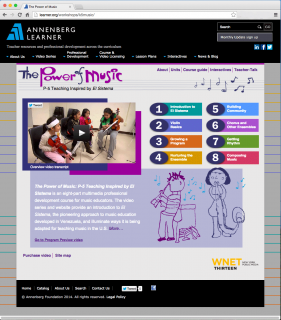 The Power of Music is a static HTML website generated from an instance of WordPress I built on my development server. This enabled Thirteen’s content producers to compose and edit pages, upload and manage images and video easily. I used the Blankslate boilerplate theme which made it easy to modify the design to accommodate the content as the team became familiar with it. To export the site to Annenberg’s webserver, Learner.org, I wrote a series of custom unix shell scripts that grabbed the generated pages, munged the URLs and added include commands that generate the common header and footer sections. This website was a joy to build. The people at WNET/Thirteen were wonderful to work with and the content they created was inspiring.